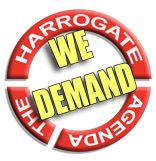 It was Niall Warry’s initiative in 2012, in close cooperation with Richard North, that organised the inaugural meeting in Harrogate which lead to the setting up of, what became known as,The Harrogate Agenda(THA). Niall’s active involvement in politics started in 1997 as a candidate for the Referendum Party, he then joined UKIP and stood in two General, one Euro and one Local election for and was Chairman of Wales and later Cheltenham. In the 2010 General Election realising that all political parties were part of the problem and weren’t offering any real or lasting solutions he stood as an Independent candidate in his constituency. After this experience it finally dawned on him that nothing would change until the system changed hence his involvement in THA and it’s six demands. Richard North has in recent years won a reputation as one of Britain s most expert defence analysts, through his Defence of the Realm blog. Formerly a research director in the European Parliament, North is also a political analyst through his EU Referendum blog, which examines Britain s place in the world with particular reference to its membership of the European Union. He has co-authored four bestselling books with the Sunday Telegraph columnist Christopher Booker, including Scared To Death: From BSE To Global Warming, How Scares Are Costing Us The Earth (2007) and The Great Deception (2005), a comprehensive history of the European Union. He is the author of Ministry of Defeat (2009).